It’s a great spot for happy pigs. Snug within the foothills of the Tararua Ranges, set against a backdrop of dark-coloured pine and drifts of native bush, lush but muddy paddocks dissected by the Waikawa Stream, Woody’s Free Range Farm must truly rate as pig heaven. 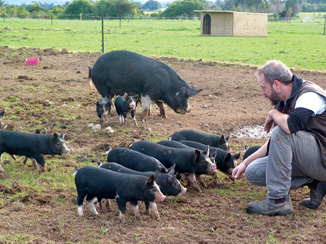 “It struck us as the perfect place to raise pigs,” says Daniel Todd, who together with wife Claire Ongley, and dog, Woody (the farm’s namesake), acquired the 80 acre Manakau property in 2013. Born in the UK, Daniel’s interest in pigs “they’re intelligent and social animals,” and pig farming developed during his 17 year employment at an Australian-based consumer electronics company. 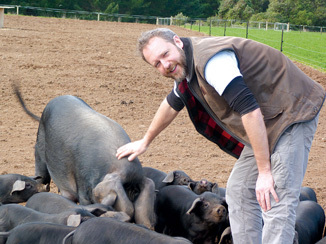 Yearning for an outside occupation, he undertook educational courses on pig farming, focusing on the ethical farming of rare breed pigs, and the couple moved to Claire’s birthplace, New Zealand, in 2013. Two breeds of heritage pigs are farmed at Woody’s – the friendly Berkshire, who with its short, upturned nose and pointy ears is known for its cuteness factor (the animals are black with white face, legs and tail), and the Large Black, distinguished by its huge, droopy ears and scooped nose – and its enormous size. The Berkshire is a low maintenance breed, making it an ideal animal for free-range farming. “The Berky is a curious pig – very sturdy, a good all-rounder. They’re also excellent mothers and good grazers,” Daniel explains. The breed is famous for exceptional marbling, which breaks down during cooking, resulting in a rich, juicy meat. The dark skin of the Large Black protects them from sun, and the breed is known for its taste (they produce excellent bacon), pasture foraging skills and overall hardiness. Like the Berkshire, the sows are great mothers, producing large litters and plenty of milk. The heritage breeds can be traced back to before industrial farming, when all pigs were kept outside in pasture, living in changing seasons and deriving nutrition from foraging. By selecting heritage breeds Daniel has chosen animals that have survived over centuries, adapted to terrain and climate, and who have often developed resistance to disease. Daniel tells me that Woody’s Free Range Farm is a registered rare breed stud with the New Zealand Pig Breeders Association and that they are also members of the Rare Breeds Conservation Society of New Zealand. TV chefs like Rick Stein and programmes such as the ‘River Cottage’ TV series have popularised rare breeds, and Daniel “basically sells out” at Wellington’s Hill Street Farmers Market and the Feilding Farmers Market.